When I got an email from MECCA.com.au saying that I had an exclusive early access to the newest Too Faced release, I knew I just had to pick it up. 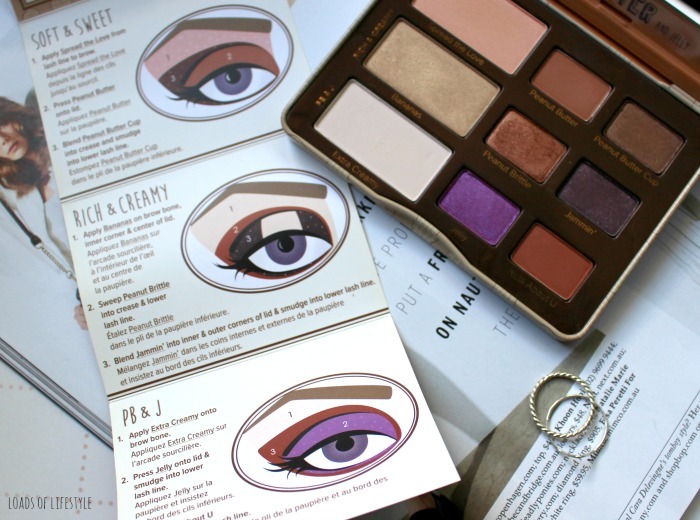 The Too Faced Peanut Butter and Jelly eyeshadow palette was inspired by the Peanut Butter shade from the famous Semi-Sweet Chocolate Bar Palette. 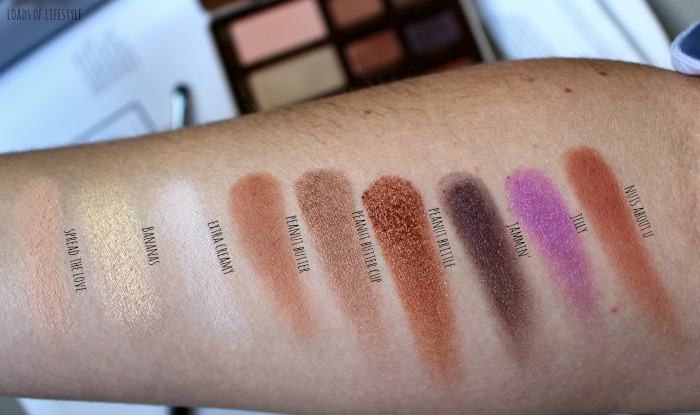 Apparently it is a beautiful transition/crease shade (unfortunately I only own the original Chocolate Bar Palette) – but now that I own this palette I can see what all the fuss is about. The palette is a little smaller than I imagined it would be – I have no idea why I pictured it bigger?? It contains 9 eyeshadows in total with 3 being matte (Extra Creamy, Peanut Butter & Nuts About U) and 6 shimmer/metallic (Spread the Love, Bananas, Peanut Butter Cup, Peanut Brittle, Jammin’ & Jelly) and with a total product weight of 11.4g. (3 x 2g and 6 x 0.9g). Priced at $58 it works out you are paying $5.08/g of shadow compared with $78 for the Chocolate Bar Palette which has 17.6g of product, which equals $4.43/g of product. A price difference of $0.65/g. Overall I am super happy so far with the gorgeous palette - I can't wait to have a play around and create a few looks with this and let you know my final thoughts about it. Also this palette smells AMAZING! It smells like Reece's Peanut Butter Cups - a favourite of mine! Yum! Will you be picking this up when it gets released? Or are you holding out for the Sweet Peach Palette?? The swatches of this palette look amazing!!! I am happy that I took the plunge and bought it although I recognize it was a bit of an unnecessary purchase. I can't wait to use mine! Yay! I can't wait to see what looks you come up with Sarah!! I am Peanut Butter & Jealous of your purchase. Looks amazeballs <3 I couldn't justify it for the price right now, need to spend my money on boring adult things like bond and furniture -_- Thanks for letting me live vicariously through you for a pinch! Dayum this palette looks so amazing! 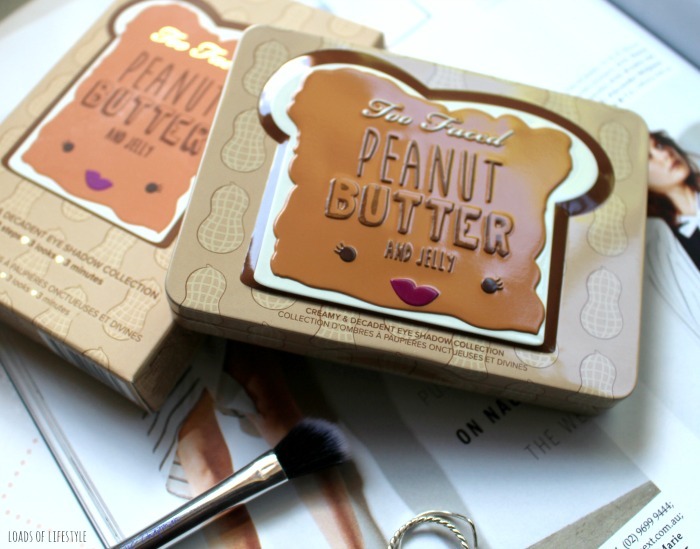 Too Faced do the cutest makeup products! I totally wish they had these in store so I could smell it haha! My friend bought it though so I'll have to pop over for a swatch and sniff! I was a little tempted by this but I must say I'm saving for the Peach palette! 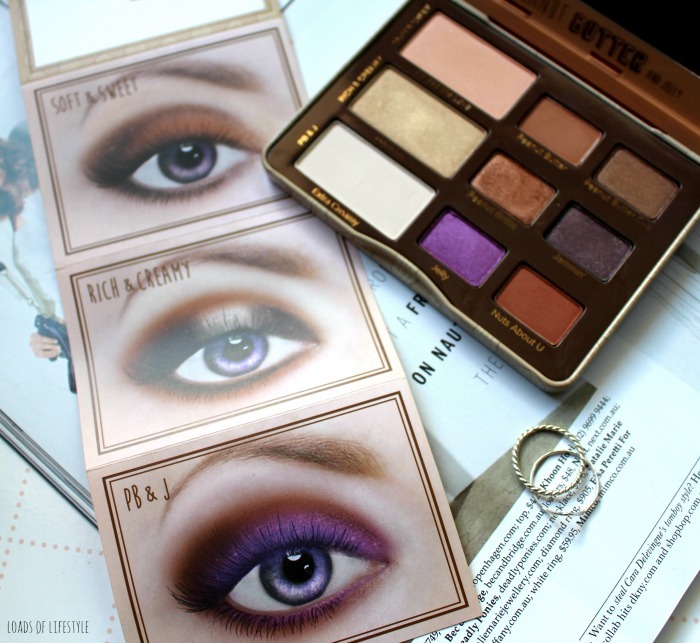 The shades in here are so gorgeous though!